The nutraceutical supplements market is heading toward a phase of consolidation, with tier 1 players extensively emphasizing on product innovations and developments. According to Fact.MR study, demand for prebiotics & probiotics dietary supplements is rising rapidly and projected to register over 10% y-o-y in 2019. Increasing awareness regarding the use of probiotics to maintain good health and to reduce the risk of multiple diseases has led to a significant demand for prebiotics and probiotics as dietary supplements. Vitamins & minerals supplements will continue to witness a significant demand in the coming years. 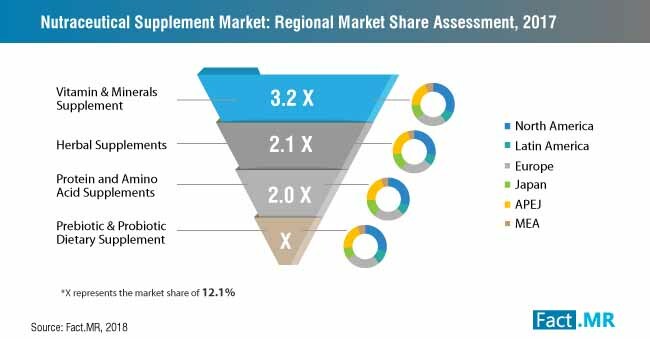 The estimations find that vitamins & minerals supplements are expected to hold over 36% of the overall share of the nutraceutical supplements market in 2019. Being the most commonly consumed dietary supplements, vitamins & minerals supplements consumption is expected to grow steadily throughout the forecast period. Herbal supplements and protein & amino acid supplements are projected to register comparable market revenues. Collectively, these segments will account for half the revenue share in 2019. Increasing preference for natural ingredients has led to a significant demand for herbal supplements. The study finds that protein & amino acid supplements revenues are expected to grow at an impressive y-o-y of 8.7% in 2019. Rising levels of dietary protein intake in daily consumption are responsible for the rising sales of protein & amino acid supplements. Fact.MR studied demand-supply scenario of different forms of nutraceutical supplements available. The study reveals that demand for the softgel form of nutraceutical supplements remained higher in the past few years and the status quo will be maintained in the coming years. In 2019, demand for softgels is projected to generate revenues worth over one fourth of the global revenues. Owing to the superiority in delivery format and enhanced bioavailability, demand for softgels will continue to grow steadily in the future. Liquid is another form which is highly preferred by consumers for nutraceutical supplements intake. Fact.MR finds that demand for liquid will closely follow softgels in the coming years. The market projections also cover increasing consumer preference for capsule and tablets on the back of increasing demand for vegetarian clean-labelled capsules and ongoing innovation in the capsule and tablet manufacturing technologies. Based on these industry trends, study opines that capsules and tablets will register faster growth at nearly 10% y-o-y in 2019. Fact.MR study finds that according to consumer orientation, sales of unisex nutraceutical supplements have spearheaded the market revenues for many years. In 2019, the trend will continue and the sales of unisex nutraceutical supplements will occupy nearly two fifth of global revenues. Further, despite lower revenues, nutraceutical supplements for kids will witness rising demand and an impressive growth rate in 2019. Fact.MR’s thorough study of nutraceutical supplements distribution network reveals that drug stores will remain a preferred choice for nutraceutical supplements purchase among consumers. This channel accounted for two fifth of the nutraceutical supplements market share in 2018. Apart from the traditional sales channel, rising consumer preference for online purchase is likely to register rising sales of nutraceutical supplements in the future. Also, consumer purchase of nutraceutical supplements through convenience stores is increasing rapidly and registered growth at nearly 11% in 2018. The study estimates that North America held nearly 30% of nutraceutical supplements market share in 2018. As the prevalence of nutrition deficiencies continues to rise, Americans are highly dependent on dietary supplements to maintain good health. While Europe represented the second largest market for nutraceutical supplements in 2018, developing regions including Latin America and APEJ reported rapid expansion of nutraceutical supplements market. APEJ registered nearly US$ 16 billion nutraceutical supplements market and grew at 9% y-o-y in 2018. The Fact.MR report tracks the nutraceutical supplements market for the period 2018-2027. According to the report, the nutraceutical supplements market is projected to grow at 7% CAGR through 2027.